As a result of their wide regional or global footprints, multi-country operators typically generate tens of billions of USD in revenues. 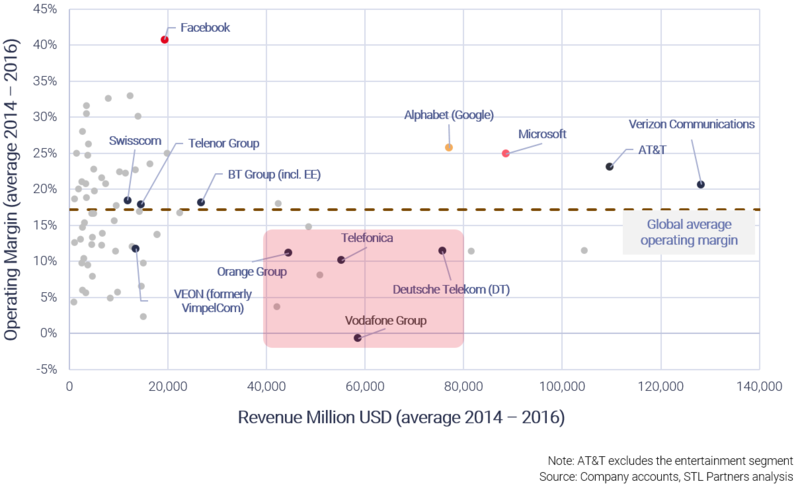 By this measure, telcos’ scale (as defined by their revenues) is indeed comparable with the likes of Google and Facebook (see Figure 2). 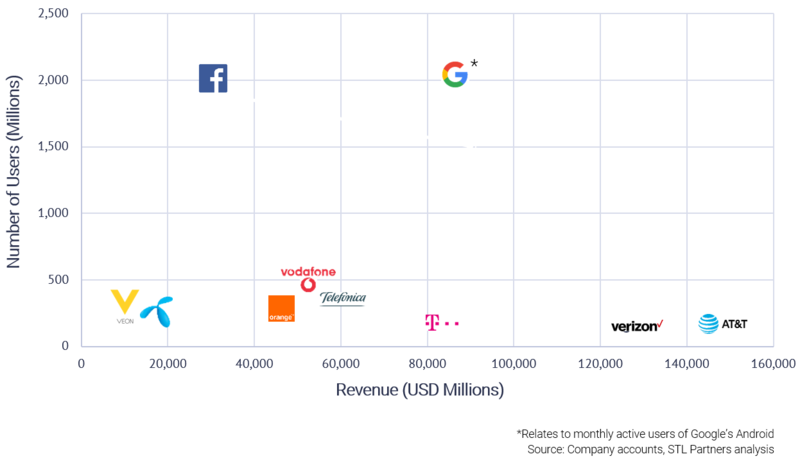 However, we can consider scale through a different lens as well: defined by the number of users, it becomes evident that telcos are dwarfed relative to the large internet companies. When considering the number of users, the telecoms industry is more fragmented than the internet sector – resulting in the unfavourable comparison, since no one telco can achieve a similar customer-base. 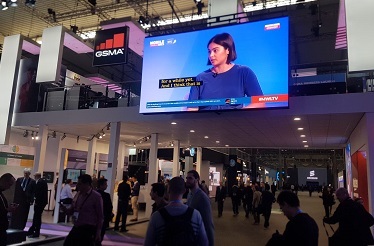 The fragmented nature of the global telecommunications industry means that telcos tend to struggle to create so-called demand-side economies of scale. These economies of scale rely on network effects stemming from the value generated by having a large number of users. In such a case, there is both inherent value in the use of the service and value derived from other people’s use of the service. The big success of the internet giants can, in part, be attributed to significant network effects. Telcos, on the other hand, are in a tougher position. Partly this is due to the nature of the services they traditionally provide. Unlike the internet giants who can reach anyone around the world with an internet connection, telcos are have largely been limited to serving users in the countries in which they operate networks. Despite this, large operators should – in theory – be well-equipped to create so-called supply-side economies of scale due to the sheer size of their business. With telecoms being a high fixed-costs business, the cost of providing telco services per customer falls as the number of customers increases. So, have these large multinational telcos managed to create scale effects? Unfortunately, we find rather sobering evidence to the contrary. Figure 3 shows that multi-country operators tend to underperform the industry average. Large European multi-country operators – such as Orange, Telefonica, Vodafone and Deutsche Telekom – all underperform the telco global average operating margin of 17%. On the other hand, large single-market operators, namely AT&T and Verizon, achieve margins above the global average. The dilemma of multinational telcos – can Telco Cloud help overcome it? Telco Cloud: a brave new world? 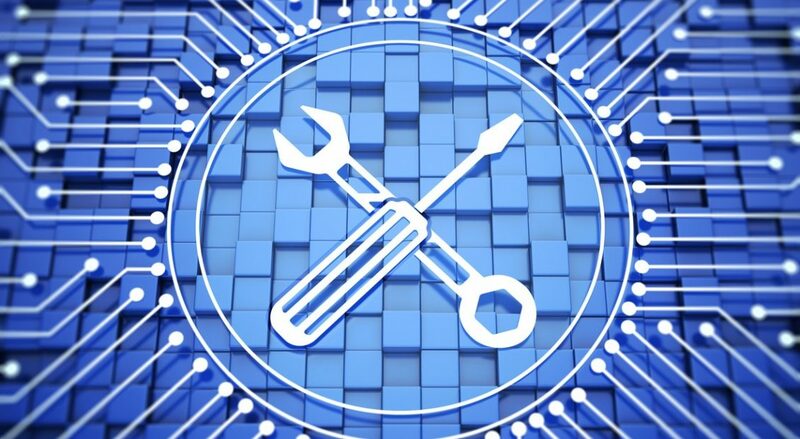 What is the right model for telcos?